Weigh Date: 4-10-19, 1359 lbs. 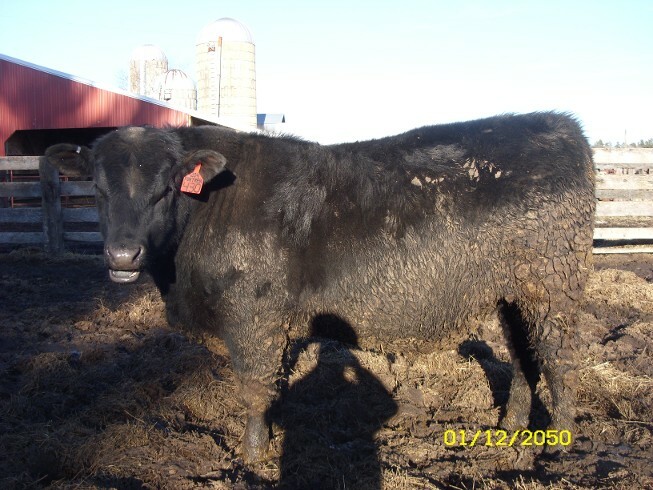 Lots to say about dam of R-430. You can walk up and scratch her anytime. Last year's calf gained 4.00 lbs/day on the cow. Thick and stout. Granddam is a Pathfinder who had 12 @ 106 WWR. Dam's own sire TC Total has over 12,000 registered offspring putting him in the top 10% of registrations in the Angus Breed. R-430 weaned off at 816 lbs @ 210 days. Sire is an incredable high growth guy with only a slightly above average frame. Pathfinder dam. We kept this dams 2017 bull calf for one of our own herd sires.There were 5 new yearly sires that were used on the farm last year and at the end of the summer her bull had out preformed the others. He is an awsome looking bull.